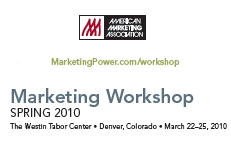 I (Ellen Naylor) will be giving a 2 hour session at the American Marketing Association’s Spring Marketing Workshop which takes place in Denver, Colorado from March 22 – 25 at the Westin Tabor Center. My talk, “Improve Your ROI by Integrating Marketing & Sales” will be given on March 23 from 2:45 – 4:45 pm, about a week before my birthday. Below is the write up which is buried in the AMA’s 20 page marketing workshop e-booklet. 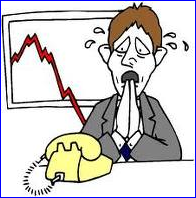 Sales and marketing are often at odds. This workshop will focus on tools and techniques that are tried and tested, which integrate the smarts of sales, marketing and product development employees. Elicitation is usually used to collect competitive intelligence. Learn what elicitation is and how it can be used to improve your company’s sales intelligence by closing more deals and enabling Sales to collect valuable information from customers to boost your company’s knowledge about market trends, customer needs and the competition to name a few. Likewise, learn how win loss analysis and trade show analysis integrate sales and marketing often with the voice of the customer and other market intelligence. Matt Kelly, VP Business Development at Strategy Software will be presenting, “Competitive Affairs: Leveraging Competitor Information to Drive Revenue and Increase Market Share. His session takes place on March 24 from 8:30 – 11:30 a.m. Matt is an engaging speaker who I have known for years through SCIP. I wanted to share this is the spirit of cooperative intelligence as it is pretty rare for the AMA to host events in Denver. March is also a great month to visit the Rocky Mountains if you like to ski as it’s our snowiest month. In the spirit of cooperative intelligence, I would like to share a competitive intelligence case study initiative that my colleague Tom Hawes is leading. He saw a need for more sharing in the field of competitive intelligence. In many cases people don’t share since well it’s the competition after all, who might be reading or listening to what I share. So he decided to create case studies for people to comment on. The first example is a story in a competitive intelligence manager’s life where he has to organize and prepare a presentation for his executive management about how a competing company is ramping up its R&D initiative. The story goes on for six days and takes a person from getting the assignment, doing a needs analysis, getting the information, making the final presentation, and dealing with people issues and communication. The idea behind the case study format is to draw people out of their shells to discuss how they would approach the issues that this CI manager faces. It is thought that people will more readily share what they know and how they do competitive intelligence, if we’re talking about a hypothetical situation rather than their company’s particular issues. Tom has gone to a lot of trouble to professionalize this case study approach by even creating a website for these cases. Tom is also creating additional cases to draw people in. I agreed to comment on the 6-day case study, and am offering a cooperative intelligence perspective to my comments. Arik Johnson and August Jackson are also offering their comments for the 6-day case study. Read and respond to the case studies and commentaries that are posted. Volunteer to write a case study. Volunteer to be an expert commentator and share your problem-solving ideas. PS If you’re a SCIP member, look for these case studies in the next 3 Competitive Intelligence Magazines! I have been reading Seth Godin’s blogs with more interest lately as he talks about our resistance to change and fear of success which he refers to as the lizard brain. While many of us are programmed at a young age to strive to be successful in our lives, we have problems with the little steps getting there, like prioritizing what we should be doing to progress, versus what we almost aimlessly “do” to get through our day, such as emails, Tweets, LinkedIn, Facebook, etc. While these daily actions help us create our brand ID and make new connections, and stay in touch with colleagues and friends, we need to have the confidence to move forward with why we’re here and how we’re going to leave our mark to humankind. I have three practices to share with you in the spirit of cooperative intelligence which help me keep balance in my life. I can get even more sidetracked since I am intellectually curious, which enables me to be a great researcher, but also makes me predisposed towards irrelevant pursuits. 1. 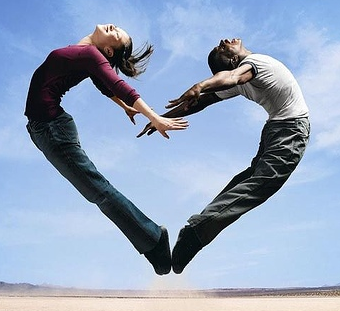 Create a list of what you want to do each day, each week, each month and each year and review them periodically. It’s interesting how things that were so important last week aren’t anymore. This helps me keep perspective and my sanity. 2. Take your emotional temperature several times a day. Your attitude drives you, but often it’s hidden away since you aren’t paying attention as you’re blindly doing. This also helps me stay focused on the bigger picture of life since I strive to bring gratefulness and optimism to the forefront. 3. Keep words and/or pictures close at hand, which help draw you to where you know you need to be. Examples for me are the Prayer of St. Francis and the Mother Teresa’s Do It Anyway prayer. 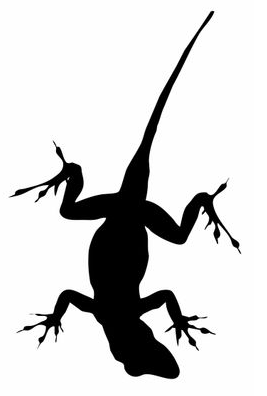 Seth’s blog about the lizard brain resonated with me, as I often resist doing what I need to be doing to move ahead by sharing my ideas about cooperative intelligence in a bigger way than just blogging. I am now driven to “Our Deepest Fear” by Marianne Williamson, which explains a lot about how the lizard brain can hold us back, but also how to get past that resistance and move forward by realizing that there is so much more to life than just your drive, and as you let your passion and love shine through, you are gifting others who feel this and bring it into their lives.